Last month, the NCC Capital Urbanism Lab hosted a talk with Mike Lydon, co-author of “Tactical Urbanism: Short-term action for longterm change”. The talk was well attended and enthusiastically received. Success stories and inspiring photos of simple and minor interventions that dramatically change the use and character of spaces from cities around the world have create a public appetite to imagine what these kinds of projects could mean for their own city. Ottawa wants on this bandwagon. As pointed out during the talk, Ottawa already has some great examples of grassroots take-overs and transformations of space. The most impressive is now so commonplace and integrated in the routine of the city that we almost don’t think of it. The Sunday bike days started as a ‘tactical’ road take-over way back in 1970 and successfully institutionalized by the NCC. More recently, there was the pop-up reading garden, the Muskoka chairs at Confederation Square, and several projects I’ve been involved with through yowLAB and Impromptu Playground. Tactical urbanism is meant to work between the community and the official city administration, between unsanctioned and sanctioned. In theory, everyday people have the flexibility and speed of ignoring red tape to “just do it” and make small, fast changes to improve their neighbourhoods. On the other end of the spectrum, city governments and institutions have the funding and power to make lasting change and to provide amenities to those who might not have the resources and luxury of making changes themselves. While a lot of the grassroots tactics are meant to challenge and critique public policy, they also acknowledge the important role public policy and programs have in shaping the city. Cities are big complicated problems. DIY can only go so far. So on top of the public buzz, it is great to see the NCC and the city are listening and looking to find ways to integrate this new (or at least newly popularized) addition to the urban planning toolbox. The City of Ottawa’s Neighbourhood Connection Office recently put out a call for applications to its new streetside spot pilot program. The program draws inspiration both from the international open-source and citizen-led Park(ing) Day movement and models from other cities such as Montreal’s rue St-Denis, Toronto’s Church Street, or Vancouver’s pilot. The city is accepting applications for the 25 spots to be made available as part of the 2016 summer pilot to run from April 1 to October 31. As one of the designers for Impromptu Playground’s Pause and Play Park(ing) Day parklet back in 2011, I am excited to see the city taking action. I do, however, want to offer some words of caution and I hope productive criticism to be considered as the city transforms the unsanctioned parklet movement into a policy for streetside spots. As images of parklets float around social media and are shared in talks and petitions to the city, it is easy to get caught up in the playfulness of the form these parklets take from “temporarily re-purposing on-street parking”. A lot of the images we now see of city-sanctioned streetside spots end up looking a lot like the citizen-designed parklets they are responding to. Without power to redesign the street, the artists and community groups that started the parklet movement are restricted to the 2.75×7.25m of a standard parking spot. Often paying for the material out of their own pocket (as we did at Impromptu Playground) the choice of material is usually pretty modest but finds creative ways to make the most of standard components and a lot of paint. The idea that you can do a lot with a little is a good lesson for cities, but I don’t think the main criticism of Park(ing) Day is the use of public funds. At its core, Park(ing) Day wants to challenge the use of public land and the accessibility to quality public spaces. When cities intervene, they should be making bigger impact. Especially in the urban core, space is at a premium and while cities are trying to find ways to cram in greenspace, they are ignoring a huge available resource they already own. The problem is that they lease it out for private use to park cars. Ottawa’s pilot program divides permits into three categories: streetside parklets for public use; streetside patios for private use by patrons of adjacent businesses; and streetside vending stalls for private retail sales. While the city has reserved 5 spots for public parklets because of their “higher contribution to the public realm”, that leaves up to 20 spots for commercial use. Private use is still being given a significant priority. Thriving mainstreets filled with local businesses are a great contribution to city life. Aside from the economic boost, they help promote walkable neighbourhoods which are good for our health, the environment, and our social connection to our community. But cities are relying more and more on commerce and private developers to provide “public” space. While they may be gathering spaces, they are rarely free spaces (neither free as in “free beer” or “free speech”). The other thing Park(ing) Day really wants to challenge cities on is to rethink public and active transportation infrastructure. Public investment and commitment to these projects will hopefully lead to opening up more space for public parks and nicely designed streetscapes and community spaces. But it is important not to lose sight that what will bring real change and progress to our city is the commitment to sustainable public and active transportation. Cars are a burden especially in dense downtown areas. 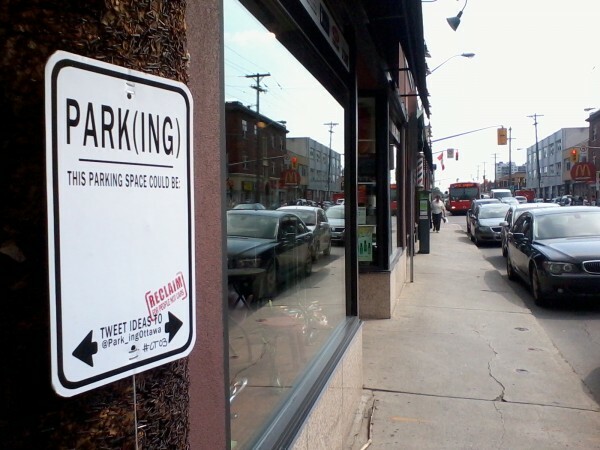 Ottawa has over 4,000 paid on-street parking spaces. Even though it is only pilot project, the conversion of 25 spots into temporarily re-purposed spaces is far from addressing the real underlying criticism of how much city space we hand over to cars. Parklets are cool and fun. But really, the place where the city truly shows it is addressing the issues raised by Park(ing) Day and where it can really make a difference is continuing to invest and commit to decreasing car dependency through projects and policies like LRT, cycling infrastructure and complete street strategies. The City of Ottawa is accepting applications for their streetside spots pilot program until December 7, 2015. UPDATE: submission deadline extended to February 15, 2016.